•How to assess the starting point in your company. Ian Preskett has many years of experience in IT. In the last 10 years Ian has specialized in SAM Process consultancy and, until recently, he was the SAM Process and Maturity Practice Manager for a large reseller of software. Ian’s philosophy is to ensure that SAM processes integrate with the service management processes to deliver highly effective SAM and reduce risk by maintaining software license compliance. 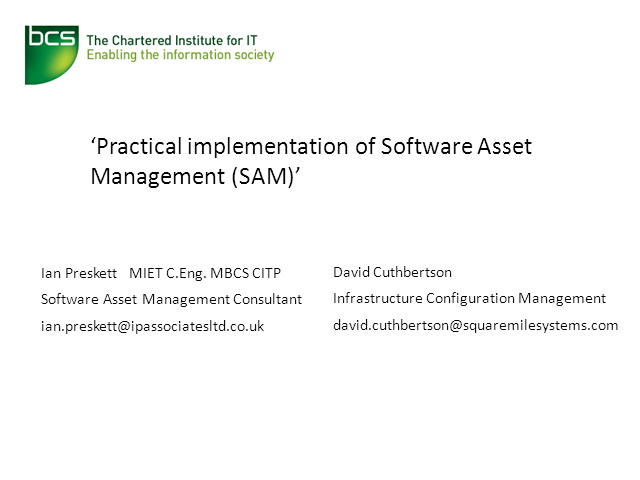 Ian is keen to promote the value of SAM to the market place, and is a committee member of the BCS CMSG (Configuration Management Specialist Group). David Cuthbertson is Managing Director at Square Mile Systems. David has been focused for many years on developing and applying configuration management techniques to technical and service infrastructure. More recently he has been developing techniques and toolsets that link service management CMDBs to data centers, networks, storage and other environments. He is a regular speaker for both the BCS and ITSMF covering all aspects of configuration management from strategic to tactical implementations.